This looks fancy, but if you’ve already prepared the pomegranate it only takes about 5 minutes! 1. Microwave the chicken patty for half of the time specified in the package’s cooking directions. 2. Microwave the cous cous with an equal amount of water in a covered bowl for about 2 minutes. 3. While the cous cous is cooking, cut each chicken in half so you have two thin pieces and spread the goat cheese in between the two pieces. 4. Take the cous cous out and let it stand covered while microwaving the chicken/goat cheese for the rest of the cooking time. 5. 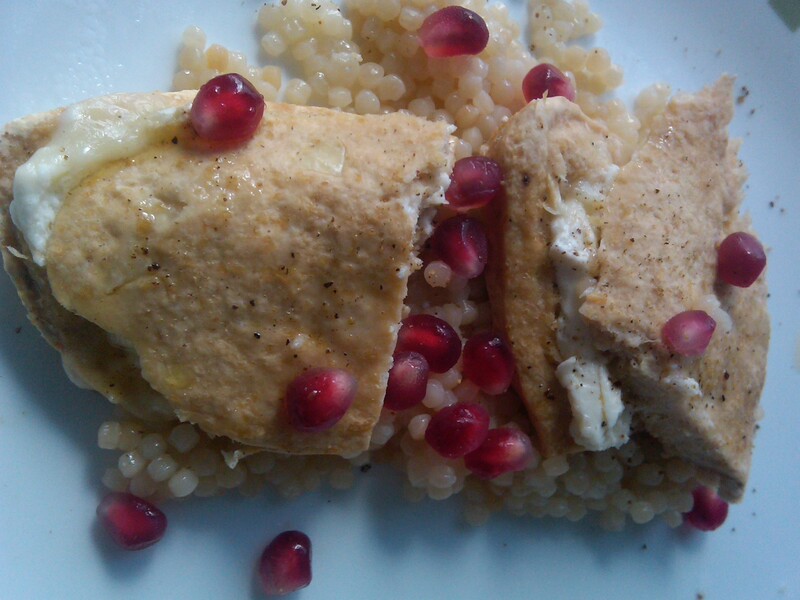 Assemble the chicken on top of a bed of cous cous, season with pepper, drizzle with olive oil, and sprinkle with pomegranate seeds. 1. Cook frozen vegetarian meatballs in the tomato sauce while it heats with the lid on and bring a large pot of water to a boil. 2. While the water for the pasta is boiling and the tomato sauce is heating, brown the mushrooms and sausage in a small amount of olive oil or cooking spray. 3. When the water is boiling add the pasta and at the same time add 3/4 of the sausage/mushroom mixture to the tomato sauce. 4. The timing on this always works out for me, if I start heating the sauce and the water at the same time, the meatballs are cooked by the time the pasta is done. 5. Top the pasta with sauce and the remaining sausage and mushrooms. Serve with a scoop of ricotta cheese and sprinkle with black pepper. This one is pretty self explanatory. In addition to those amazing yellow tomatoes, we’ve been getting A LOT of summer squash and zucchini. For this delicious dinner, I cut tofu into cutlets, seasoned them with salt and pepper and pan fried them in a 50/50 mix of olive oil and butter. Then I drained the tofu on some paper towels and used the remaining oil/butter to cook cubed squash and zucchini. I added in some shredded napa cabbage towards the end, and then some capers and parm, and voila! Veggies + tofu on top of whole wheat cous cous = delicious and filling! I just made this refreshing and protein packed lunch after a long run. Yum, I had to share it right away. FYI, this dish has about 20 grams of protein, 7 grams of fat, 250 calories, 7 grams of fiber, and about 20% of your daily iron requirement. Not bad, especially because it is so tasty and filling. It also could be an ad for Trader Joe’s. 2. In the bottom of your bowl combine the yogurt and the chopped garlic scape. 3. Add the lentils and mix with the yogurt. 4. Put the sausage, onion, garlic scape combo on top and you’re done. 1. Mix all of the filling ingredients together and fill the won ton wrappers. 2. Coat a pan with cooking spray and melt the butter. 3. Lightly fry the won tons until they are browned on each side. 4. I added about a 1/4 cup of additional salsa to left over Pea and Cauliflower soup heated it up and used it as a sauce with a dollup of sour cream on top.